EarthNight is an upcoming platformer by developer Cleaversoft. It’s in the vein of endless runners, but Cleaversoft claims it is “the deepest runner game you will ever play.” We managed to spend a good chunk of time playing the game while at Sony’s PlayStation Experience 2017 expo, and it manages to live up to its billing. So what’s going on in EarthNight? Well, the world has been taken over by dragons. Humanity has been reduced to small clusters of refugees floating in space, and it’s up to high-schooler Sydney and freelance photographer Stanley to skydive their way to EarthNight, which is what the planet is called now. One of EarthNight’s most striking features is its artwork. Everything is hand-painted, with impressive attention to detail on, well, anything that appears on-screen. Levels take place in six different layers above the planet, on the backs of massive dragons. Each dragon is actually procedurally generated, but not in a completely random way. Levels consist of three sections: beginning, middle, and end. Each section has at least five hand-designed variations, and it’s these variations which spawn procedurally with each playthrough of the game. This means that each time you play, you’ll be treated to a unique playthrough. This was evident even with our short hands-on time. While the representative spoke with us, although he had never seen the particular level we were playing, there were clear signs when levels were transitioning into different sections. Cleaversoft kept things deceptively simple with EarthNight. It’s a running platformer, where the player runs automatically. The dragons that make up levels have all manner of items on their backs, from bananas and doughnuts to old CRT monitors and the occasional stuffed teddy bear. There are also enemies, up to hundreds of them just waiting to take your life. Controlling speed and timing jumps properly can result in taking out multiple enemies in one giant combo. Both of the two playable characters have different attributes, which we weren’t really able to utilize to their fullest extend during our short time with the game – but it will be challenging to master the two of them. The booth setup by Cleaversoft was one of the more unique ones at PSX. The booth itself was on the small side. They only had the game running on a single PS4, sure. But they had the musician who actually recorded the soundtrack performing live as people played the game. 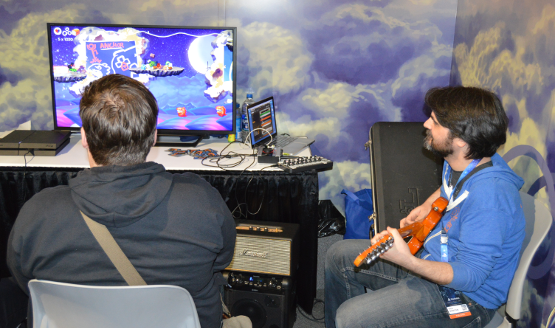 He was playing on an electric guitar, which was hooked up to a filter of some sort to produce a chiptune-like sound that filled the space with great nostalgia-inducing audio. EarthNight is about sound almost as much as it is about hand-painted, surreal visuals, as could clearly be seen in their booth. Anything that the player collects or otherwise interacts with adds to EarthNight’s soundtrack, and getting into a good rhythm bouncing off of enemies and boosting in mid-air results in a better-sounding song. There are few games which can produce Zen-like sensations in their players, but EarthNight is a shining example of what it takes. There is a lot of surreal scenery to take in, and fractions of a second in which to react to stimulus. But thanks to the aforementioned soundtrack, discovering the rhythm of a particular level will not only pay off in a higher score, but will also just feel damn good to perform. 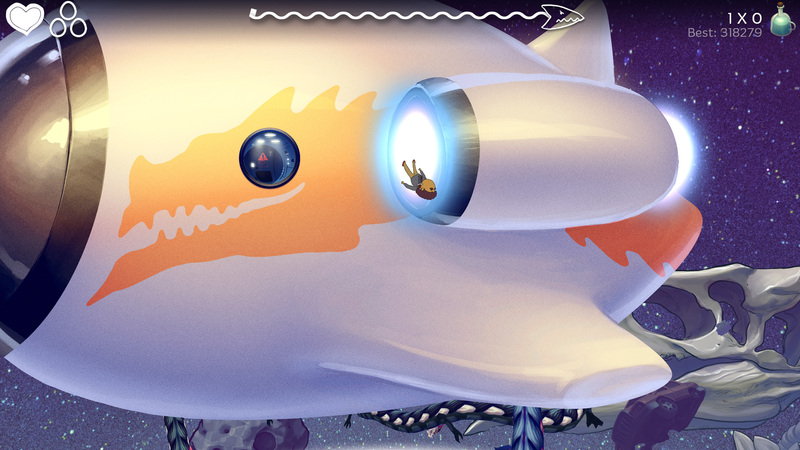 EarthNight is shaping up be one of the most chilled-out experiences in the gaming space. A relaxed soundtrack belies the demanding platforming required, and the surreal levels consisting of the backs of dragons littered with seemingly random items will take at least a few hours to master. Failure is bound to happen, but the game is so relaxing you probably won’t mind giving it just one more go. “EarthNight will be released when it’s done,” according to Cleaversoft. So here’s hoping there’s not too long of a wait left! EarthNight PS4 preview conducted at PlayStation Experience 2017.